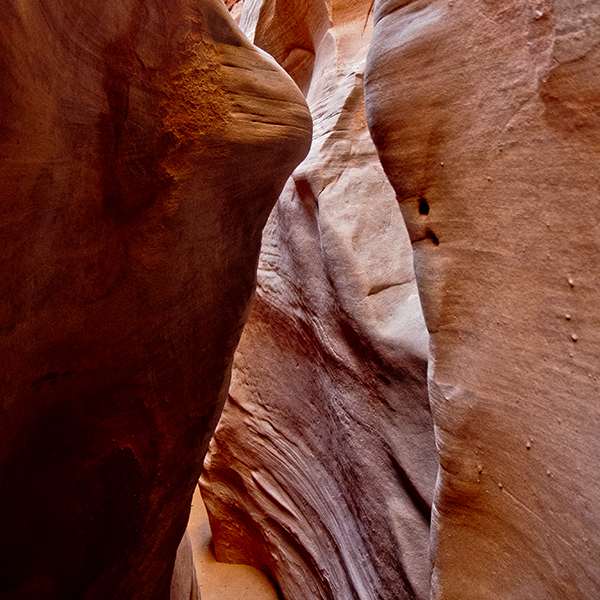 A trip of slot canyons, the tightest and darkest in all of Grand Staircase-Escalante National Monument, are short enough to explore all three in a single day. 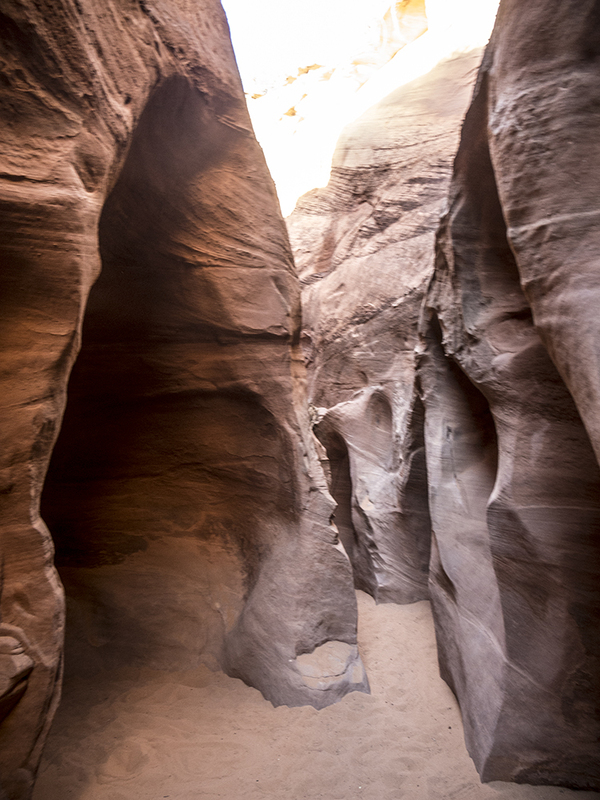 Exploring slot canyons is a rite of passage for most Southwest adventurers — for some, the narrower and deeper the canyon the better. Peekaboo, Spooky, and Brimstone won’t disappoint. They are true slots, so narrow you must take off your pack to shuffle sideways through these convoluted cracks! Note: While you need technical gear and/or climbing experience to explore Spooky and Peekaboo in their entirety, it’s also possible to just wander through them until a pothole, down climb, or chockstone blocks passage, marking a turnaround point. Consider hiking with a partner, which makes maneuvering past obstacles much easier. Lend a hand, give a boost, and spot your fellow hikers. From the 4WD parking area, walk towards the trail register box. The path heads northeast from here, switchbacking down a steep slope. Follow cairns across the bare rock, and continue descending along a sandy trail. 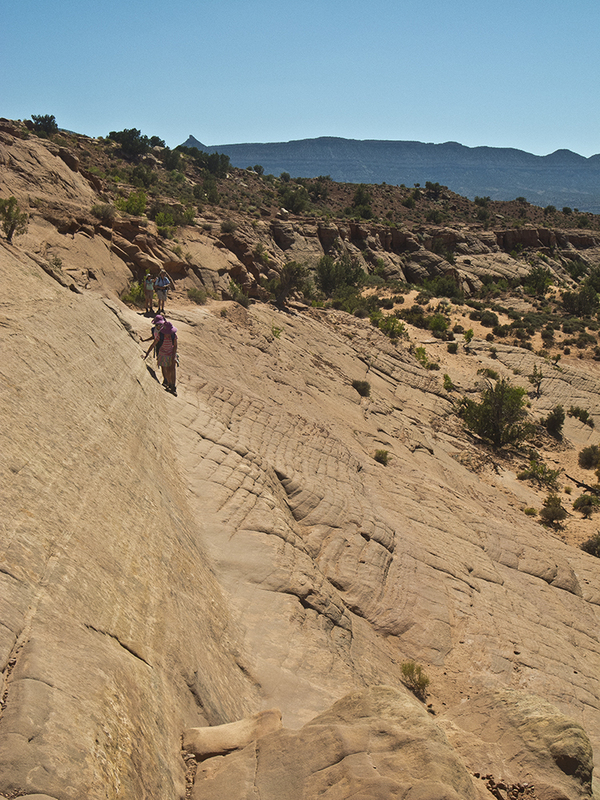 A polished slickrock chute takes you to the bottom of a small drainage that flows into Dry Fork Coyote Gulch. After hiking along the drainage floor for a short distance, you arrive at Dry Fork, from which you can access Peekaboo, Spooky, and Brimstone slot canyons. The following descriptions are meant to get you to the canyons. Exploring the slots is your job, probing as far as your technical skills allow. Turn right at Dry Fork and cross to the other side of the wash. Almost immediately (only a minute or so down the trail) look to the left wall for the entrance to Peekaboo, which is about 20 feet above the canyon floor. A pile of rocks gives you a boost, and hand-carved steps in the rock help you climb over the sculpted lip to the bottom of a pothole. Near the mouth of Peakaboo, you see double natural bridges separated by huge potholes. You feel like you’re climbing through swiss cheese holes as you make your way through this sculpted slot. A little ways upcanyon, the walls diminish in height. 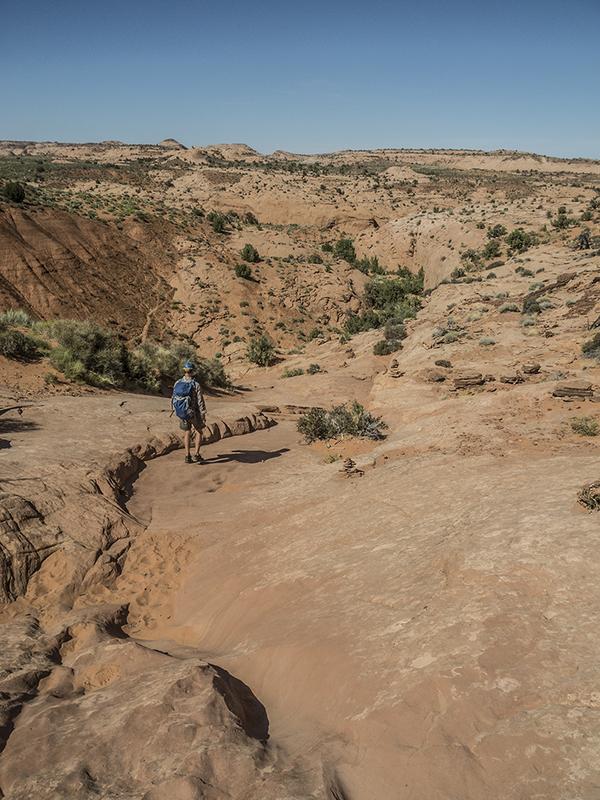 You have two options from here: turn around and retrace your steps back to Dry Fork; or find a route out of Peekaboo, hike due east cross country, and drop into Spooky Gulch. Spooky Gulch is about a half mile east of Peekaboo and the next drainage on the left if you’re heading down Dry Fork. The mouth of Spooky is broad and sandy, but the walls quickly constrict as you head upcanyon. You have to shed your pack to squeeze through this one! After you’ve gotten a sufficient tummy tuck, head back to Dry Fork and walk down the wash to Brimstone. Not as many people venture over to Brimstone. It’s a long haul there, plus it stalls hikers quickly with difficult obstacles. Little light reaches into its depths, making it the darkest and scariest of them all. From Spooky, turn left and continue down Dry Fork. A chockstone interrupts the otherwise easy walk. Pass it on the right by downclimbing about 8 feet. Dry Fork pinches into a short narrow section before opening up. About 0.8 mile from Spooky, you see a cairn at the mouth of a broad drainage. Turn left, hiking past the sandstone dome that sits in the middle of the drainage. Slog through sand for a mile before reaching the Brimstone slot. You will likely find pools of water near the entrance. 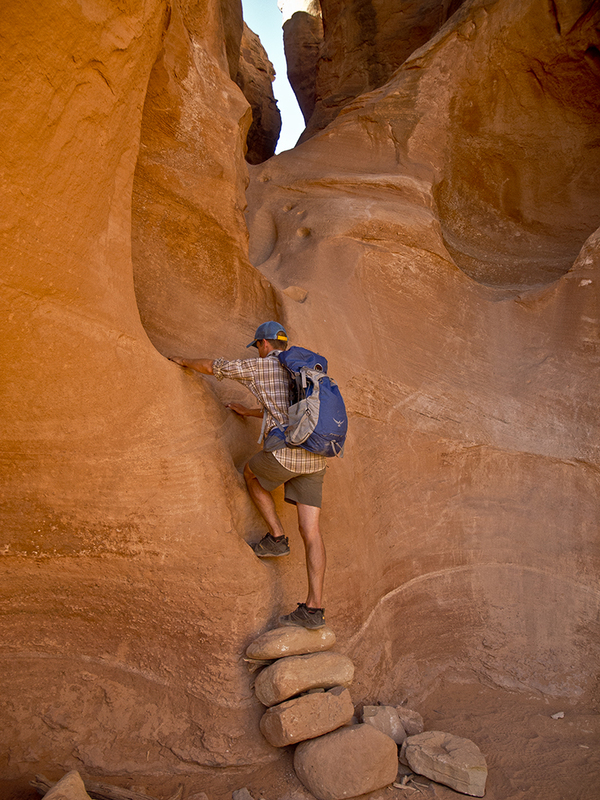 When the canyon walls narrow to a few inches apart, your progress up Brimstone will likely stop. Retrace your steps back up Dry Fork to the trailhead. From the post office in Escalante, Utah, drive east on UT 12 for about 5 miles. Turn right onto Hole-in-the-Rock Road, and reset your odometer to 0. Continue heading southeast on this road for 26 miles. Turn left on the spur road toward Dry Fork Coyote Gulch. A 2WD parking area is just over a half mile down the road, or if you have a high clearance vehicle, you can continue another mile to the trailhead. Veer left at the 2WD parking area and follow the rough road to the 4WD parking area.